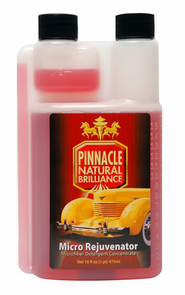 Don�t drown your microfibers, clean and restore them with Pinnacle Micro Rejuvenator! Pinnacle Micro Rejuvenator now includes a 3 oz. measuring cup with every bottle. One ounce for small loads and two ounces for large loads. Because there has never been a material like microfiber before, there has never been a detergent capable of properly cleaning it�until now! Pinnacle Micro Rejuvenator is not your average detergent. It is formulated specifically to meet the unique demands of microfiber. Since microfiber pulls contaminants deep within its fibers, conventional detergents may not remove all of the stains. Micro Rejuvenator is made specifically to break down stain molecules deep inside the weave and suspend them until the rinse cycle washes them away. Thanks to a powerful degreaser, oily automotive stains don�t stand a chance. 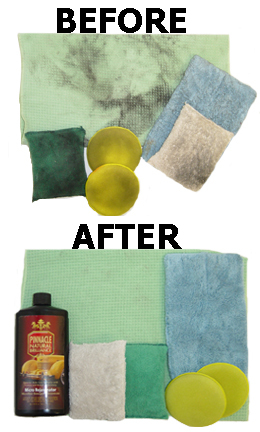 Restore your microfiber towels and pads every time you wash them with the detergent formulated specifically for microfiber � Pinnacle Micro Rejuvenator! I not only washed the drying towels I bought from your company, but also my cotton cleaning and dusting rags in this detergent. All came out clean and they now really absorb water well. ProsDoes what it says it will do. I am very happy with this product. It produces very little suds, and leaves all my microfiber towels soft, neutral smelling, and is very effective at removing stains. It also leaves the washing machine fresh and clean, I don't worry about washing my car towels in the same machine I launder my clothes in. I recommend this product for removing light products such as wax, polish, compounds, and detailers. I don't recommend it for heavy, greasy products such as tire treatments. ProsOne ounce of product produces soft, fluffy towels. Low suds. leaves the washing machine clean. Comes with a measuring cup. Best I've tried. Cleans well and leaves softest texture of any I've tried - often better than new.